The Skyland Farm team and trainer Denice Perry had a great time at the Maryland Horse & Pony Show, held September 12-16 at the Prince Georges Equestrian Center in Upper Marlboro, Maryland. Emma Pell and Judith Hahn’s Twizzler continued their winning streak, capturing the Small/Medium Green Pony Hunter championship with three blue ribbons, including the under saddle. Barnmate Mosie Pennington enjoyed presenting the Small Pony Under Saddle Trophy to her friend Emma! Emma and F15 enjoyed a banner show, winning the NHS 3’3” Medal class and making the call back in the MHSA Medal Finals. It was also a great show back for Leslie Kopp and Fenwick. 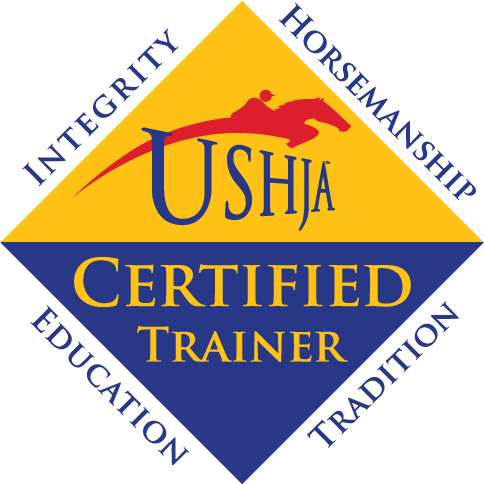 “They had super trips throughout the week, with ribbons in the USHJA and Local divisions. After a summer break, Leslie returned to the ring with El Cano, and they earned ribbons in the Low and High Adult Jumpers. She rode beautifully,” said Denice. Skyland also welcomed Stephanie Vazquez to the team! She and Irish Rambler earned top ribbons in the Large Pony Hunters, and Stephanie also brought a Pre-Green horse to Skyland that will show in the near future. “My friend Carol Eichner has done a great job teaching Stephanie, so I’m really looking forward to helping her with her horse,” added Denice.